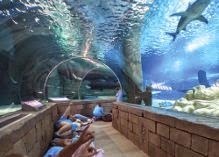 $5 Off Sea Life SEA LIFE Kansas City Aquarium Admission! SEA LIFE Kansas City Aquarium will transport you into the amazing underwater world. Come nose to nose with sharks and prepare for astonishingly close views of everything from humble starfish and seahorses to graceful rays. To get any closer you'd have to get wet! Are you a Shark lover or Seahorse fanatic? Perhaps it's the graceful rays or the clever Octopus that you love the most. Maybe you simply can't decide! Here at SEA LIFE Kansas City you can make up your mind and see them all - from the curious and the rescued to the rare and the enigmatic. And you'll be able to get closer to them than ever before. 2015 SEA LIFE Summer Camps - Enrolling Now! Splash in to a world of adventure during our 2015 SEA LIFE Summer Camps! This opportunity is perfect for campers ranging in age from 8 - 12 years old. $5 Off Sea Life Admission - Receive $5 off full price admission ticket. Explore LEGOLAND Discovery Center Kansas City, the ultimate indoor playground for kids ages 3-10 who are the biggest fans of LEGO! LEGOLAND Discovery Center Kansas City is one of Kansas City's best attractions for kids! Reach out and touch the stars in our 4D cinema, build the fastest car in Build & Test, save the princess at Kingdom Quest Laser Ride, or have the ultimate LEGO birthday party. Plan your family visit and jump into the biggest box of LEGO bricks! NEW FOR 2015: Come and visit our LEGO Star Wars: Episode IV A New Hope Miniland Model Display - Now Open! As part of the new intergalactic exhibit, guests can help the Rebel Alliance destroy the Galactic Empire's powerful Death Star, experience the epic duel between Obi-Wan Kenobi and Darth Vader, watch in awe as the Millennium Falcon rises from the deserts of Tatooine, discover the bustling city of Mos Eisley, and take in the busy cantina where the band plays its familiar tune and dangerous characters lurk in dark corners.